An evocative short story by Lena Grahn. The light of dawn spread slowly over the fir forest covered horizon. For a short moment, the rays of sun set the sky on fire, enveloping the wintry countryside with golden yellow light. Against this glowing backdrop, the triangular profile of reindeer hide covered lávvus could be seen. The air above the smoke openings quivered as the heat from the burning fires rose and blended with the cold winter air. The small herd of reindeer, gathered together close to the temporary dwelling site, were already digging for the coveted reindeer lichen in the semi-deep snow. Over by the spring, some early morning visitors had already left tracks behind them in the snow which had fallen during the night, covering the ground like a virgin blanket, hiding any trace of previous activities. Leila's stock of water had run out and now she was following the path formed by other footsteps through the snow, leather bag in hand, making her way to the spring. The sharp cold air stung like needles in her nostrils and Leila moved briskly as she went about her business. On her way back to the lávvu, whose entrance faced the rising sun, Leila saw the white smoke rising from the smoke opening, telling the world that she had just put a layer of raw wood on the fire. Some way off, the men at the dwelling had gathered. She heard their excited, eager voices as she went inside the lávvu and was enveloped by its cozy warmth. The atmosphere over by the men was one of excitement and anticipation. On this day, neither the women nor the warmth of the lávvus were of any interest to them. Niilas, Mihkkel and the other hunters were making their final preparations for the day's difficult and dangerous task. The traditional rites had been carefully carried out to bring on good luck when they challenged the bear, an animal with the intelligence of a man and the strength of twelve. 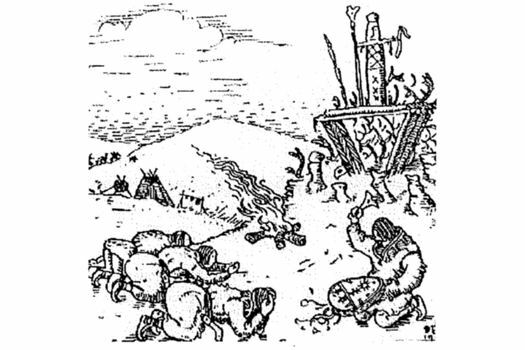 The day before, the men had prayed to sieidis which were placed around the sacrificial fires, while the noaidi sang bear joiks and drummed on a bearskin. The noaidi had also requested permission from the bear spirit to kill a bear. "It's time to go now," Biera called out. 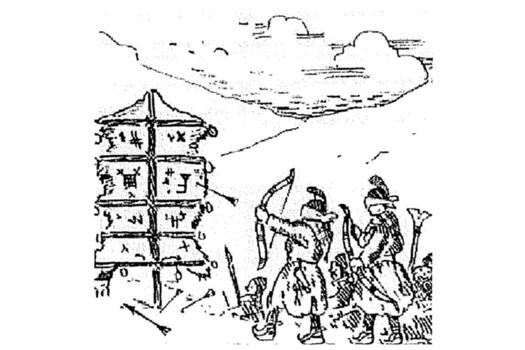 As Ãggi, the team's most successful hunter, beat on the drum to bring on good luck for the hunt, the men lined up in a predetermined order. With his skis on his feet, Biera took the lead as it was he who had discovered the bear's winter quarters. In his hand, he held the stick with the brass ring that would protect him from evil powers and thereby bring on good hunting. After him came Ãggi, who had brought on good luck through his drumming, and then the third man was Niilas, the hunter who had been appointed to kill the bear. The rest of the team followed after, each man in his own special place. Hunters praying to sieidis while the noaidi sings bear joiks and drums on a bear skin. The men set off, the steam from their breath rising like small clouds of smoke to the sky. As they ski-ed towards the bear's winter quarters, their topic of conversation was of course the animal that they were out to kill. "Isn't it amazing that a living creature can sleep for so long without eating or drinking anything?" said Biera. "It's not so strange! We know that our mountain grandfather has left Earth temporarily and is in the world of the gods. His body doesn't need much food there. "Now it was Ãnde who joined in the conversation. Ski-ing over the glistening snow towards the hibernating den, there was much talk about the magical powers of the bear and about the blood that would be taken from its body and drunk by all the hunters so as to give them the courage and power of the bear. Back at the dwelling, most people had got up to get the new day started. Only old Elle was still lying on her thick, insulating bed of spruce twigs and reindeer hides. She was too weak from sickness to get up. Her feet were inside leather bags to keep warm and over her body, she had warm blankets made of reindeer calf hides. Leila, the wife of Biera who was the hunter who had discovered the bear's winter quarters, was busy with morning chores. Little Innga needed to be fed and Leila was also getting her own breakfast ready: a piece of dried pike, some reindeer broth and some of the nourishing porridge - a vitamin-packed mixture of Lapland mountain sorrel and reindeer milk - that she had prepared in the summer and which she kept in a keg that was sunken in the spring water. The rectangular hearth, the Ãrra, marked out with stones in the middle of the lávvu, and the two logs positioned between the fireplace and the entrance, divided the lávvu into two rooms with a narrow area between the logs. That was where the small stock of firewood was kept. In the limited space available, everything had its own place and likewise, Leila and Biera had their own areas in the lávvu. As you came in, Leila's space was to the right, nearest to the kitchen domain. She had rolled up her night-time bed and placed it furthest out by the wall in order to make more room for the day's activities. Next to her bed she had her giisa, a little box where she kept her personal belongings. Little Innga, who had been awake for quite a while now, had been lying contentedly burbling in her gietkka, the cradle that hung from the ceiling. The cradle was made of wood and tanned reindeer hide and had dried sphagnum moss at the bottom which kept the baby dry. Now the little girl was making more impatient noises. Leila laid the baby to her breast and Innga immediately turned her head towards her mother's warm body. Soon you could hear the baby's eager swallowing as she drank the warm milk. At the same time as she breastfed her baby, Leila continued with the cooking. A pot of reindeer broth was hanging over the fire in the middle of the lávvu. Leila wanted to add some tasty, red pine bark to the broth. She and the others had gathered the bark in the summer month, the geassemÃ¡nnu, and then roasted it in a covered cooking pit in the ground. She leaned carefully over to the kitchen area, the boaššu, located at the back of the lávvu behind the fire, and grabbed hold of the little leather bag containing the bark. With one hand, she got some out and added it to the steaming broth. The layers of raw logs, which Leila had placed at the top of the carefully stacked fire before going to fetch water from the spring, had sunk down and been replaced by new layers of raw pine logs. The flames now reached eagerly for the dried-out logs and enveloped them, causing them to catch fire. This was the extra bit of heat that was needed to make the broth boil. As Leila did her morning chores, she kept thinking about Biera and the other men in the hunting team. For her, and indeed all the women at the dwelling, this was a day of excitement and anticipation but also some anxiety. Would the men succeed in killing the bear without anyone getting hurt? The fact that the women were not allowed to take an active part in many of the rites, could not follow after the hunters, see the bear being killed nor the meat being cooked were all customs and rules that no one questioned. Leila knew exactly the role she was to play during the activities of the coming days. The hunters had now reached the bear's winter quarters, a hollow between two large blocks of stone. They carefully formed a circle around the spot as Biera went over to the sleeping bear and pushed at it with his spear. There was no reaction. Biera pushed at the bear again and now it moved a little. Nilaas, the man appointed to kill the bear, stood ready with his spear. He held it upright with the blunt end on the ground, hiding the spearhead with his body. 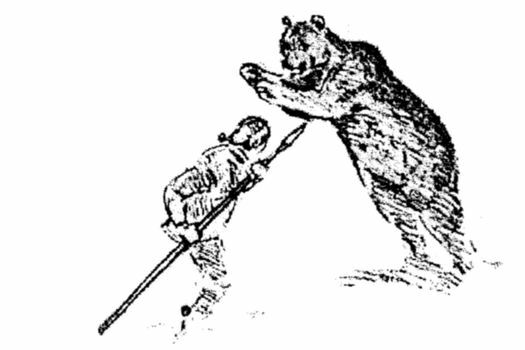 When the bear raised himself up on his hind legs and lunged at the hunter, Nilaas would reveal the spearhead, and then the bear's own weight would do the job. If all went well, the spear would penetrate the animal's wide breast or throat and Nilaas would have time to jump out of the way. Now the bear began to wake up properly. Biera pushed at it yet again, this time very hard, and then stepped away quickly from the animal. With a growl, the huge male bear got up, somewhat unsteady, on his legs. The men were fully focused on the dangerous task at hand. Their bodies were tense; their eyes fixed on the sacred prey. During the New Year's month, the ođđajagimannu, the days were short. The pale winter light from the sun was receding as the sun began to set behind the mountain. The women at the dwelling had all put on their nicest clothes. In one of the lávvus, Ãnne, Máret and some other women were sitting waiting impatiently on soft reindeer hides spread out over the thick spruce twigs which covered the ground on each side of the fire. The ends of the twigs were kept in place by the two logs which were positioned between the fireplace and the entrance. The logs led cold, fresh air with plenty of oxygen in towards the fire which was crackling and burning, spreading light and warmth to the room. Every now and then, one of the women would take some firewood from the bare ground between the two logs and place it on the fire. As the smoke slowly made its way up to the smoke opening, the flames made diffuse shadows dance along the walls between the lávvu frame's slender spruce poles. At the top, where the poles came together, the smoke found its way out into the crisp winter air. The alder bark had been well-chewed and was now ready, close at hand in the kitchen area, the boaššu, behind the fireplace. "I hope everything's gone well and no one's been subjected to the bear spirit's anger," said Máret. "Oh, the bear hunters know what they have to do to protect themselves and us here at home," Ánne said. "We don't need to worry". "I can't help it. I won't be happy until the men are home again and I can see with my own eyes that they are all right," said Máret. 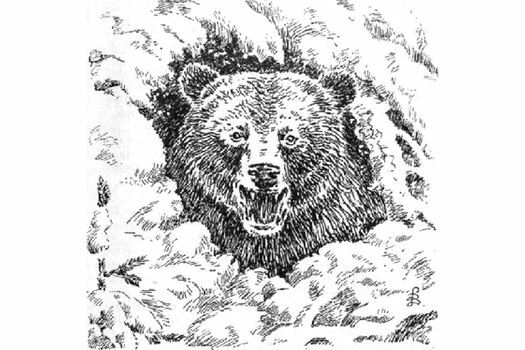 "Ssshhhh, I can hear something," said Leila, the wife of the hunter who had discovered the bear's hibernating-den. The women could hear the men singing in the distance; the hunting team would soon be back! "The alder bark! Where's the alder bark? "Ánne called out, her voice full of excitement and anticipation. The singing got louder and the women put the alder bark in their mouths. 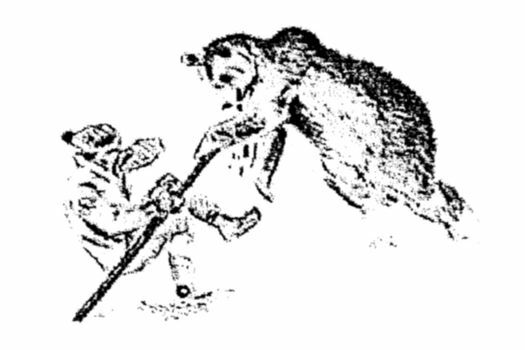 As tradition had it, Niilas, the bear slayer, was met with a rain of chewed alder bark, spat at him by the women, as he crept through the opening of the boaššu. His two dogs came into the lávvu with him and they were also honoured by having alder bark spat at them. It was now day four of the bear feast. The meat which had been cooked by the men was almost all eaten and as tradition had it, the front part of the bear had gone to the men and the rear part to the women since the dangerous power of the animal was less potent there. During the festivities, the men had all slept in the slaughter lávvu, away from the womenfolk. Over the course of these days, Ánne had glanced at Niilas many times. He was the hunter who had stabbed his spear into the big male bear. Ánne thought that Niilas was both good-looking and brave. On a couple of occasions, when Niilas had noticed that she had been looking at him, he had looked back at her; making her heart flutter and cheeks blush. "Tomorrow, I'm going to hit the bear skin; you wait and see," she said to Leila who was sitting beside her by the fire. Leila looked at her and smiled, understanding what it was the young woman had in mind. When the meat had been eaten up, the bear's bones were carefully gathered together and placed in a spruce-clad hollow, the size of a bear, placed in the same position they had had inside the sacred animal when it was alive. The bear funeral was now over and the men were busy stretching out the bear hide and hanging it up on a pole. Up to now, the women had not been allowed to take part in any of the rites linked to the bear hunt but now at last it was their turn to be the centre of attention and participate in the ancient customs. Tradition had it that the first woman to hit the bear hide would marry the man who had killed the bear. If that woman were already married, her husband would be the one to kill the next bear. The atmosphere was jovial. Máret giggled as she was handed a spear of alder and blindfolded. It was now Ánne's turn to have her eyes blindfolded. She looked over at Niilas and then at Leila who looked back at her. The two women smiled fleetingly at each other. As Ánne prepared to turn to throw the spear, she saw in her mind's eye how it flew through the air and then penetrated the spot where the bear's heart had been. She slowly raised the spear over her shoulder and then, with a triumphant shout, threw it at her chosen target.